If you’ve never experienced sweet and salty together, then this is definitely the recipe you should try. Even my husband loved it. 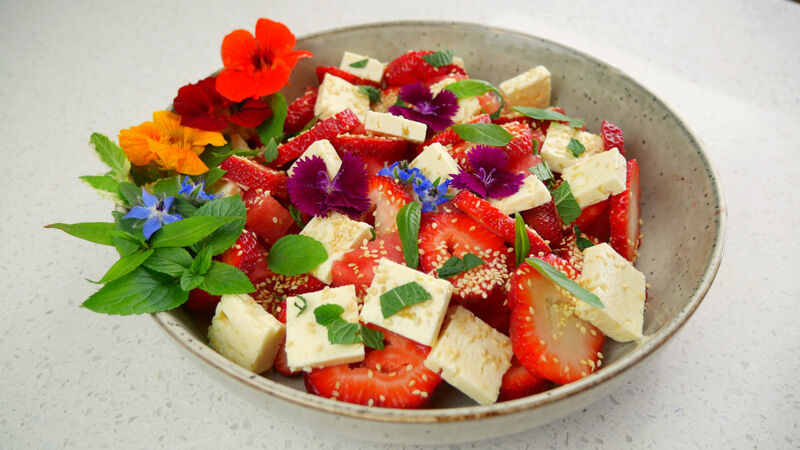 This sweet & salty watermelon salad is topped off with some stunning edible flowers. 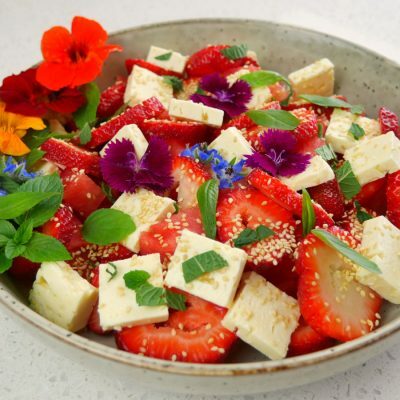 You’ll find the sweetness of the strawberries and watermelon is beautifully balanced with the saltiness of the feta cheese. Providing a perfect side salad for any meal this salad needs to make it to your list. Not all flowers are edible, but some have quite unique flavours and can really add that piece of magic to a dish. I love using them for presenting dishes because it adds that connection between garden and plate that we often take for granted. You’ll find most herbs and vegetables have edible flowers and you are probably already growing some plants with edible flowers. For this recipe, we have used nasturtiums, borage and sweet William, all of which are in our food garden. Nasturtiums are a valuable companion plant to help control aphids and we use borage to enhance the performance of our tomatoes plus feed our pollinators. I’m sure you’ll agree that definitely add a little bit of magic to our watermelon salad. 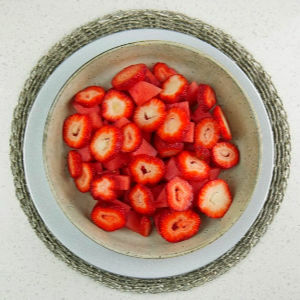 Gently combine all of the above in a large bowl, dress using a good quality balsamic vinegar and serve. Delicious!